The origins of Casa Amatller date back to the end of the 19th century when the successful chocolate magnate Antoni Amatller commissioned the remodelling of an 1875 building to Josep Puig i Cadafalch, who collaborated with other Modernista artists such as the sculptors Eusebi Arnau and Alfons Juyol. Casa Amatller. 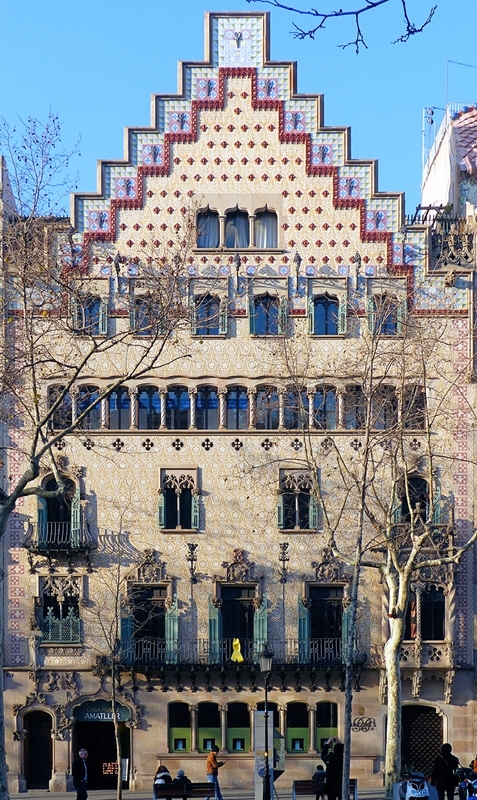 Main Facade in Passeig de Gràcia. 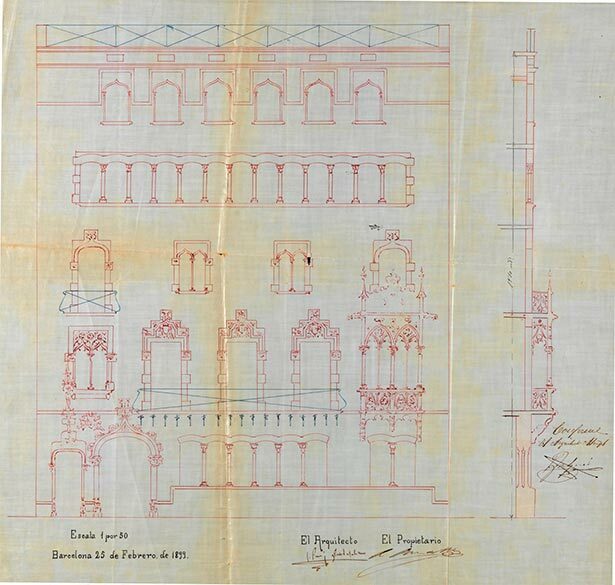 The house already existed, it was built in 1875 by master builder Antoni Robert and known as Casa Martorell, a three-story neoclassical style building, typical of the Cerdà Plan. 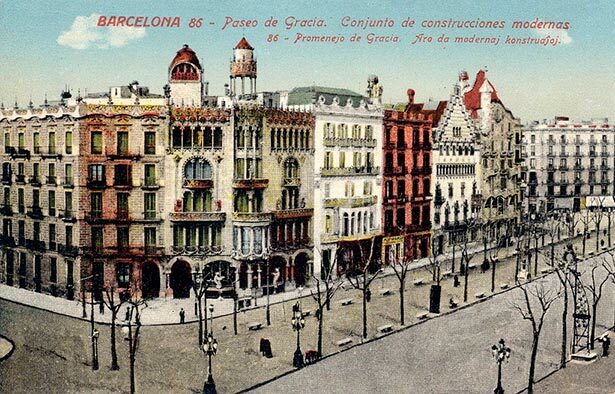 Antoni Amatller purchased the building in 1898 and commissioned Puig i Cadafalch the remodeling. Puig i Cadafalch specifically reformed the facade, the noble floor, the lobby, the common spaces (neighbor’s staircase and inner patio), and the photographic studio in the gable end of the house. Attached to Casa Batlló, the fact that they are touching each other and both are impressive houses makes its location site a stunning landmark still known as the Block of Discord. The building is located on the Block of Discord, so called due to the contrasting styles evident in its three Modernista buildings: Casa Batlló by Gaudí, Casa Amatller by Puig i Cadafalch, and Casa Lleó Morera by Domènech i Montaner. Puig i Cadafalch’s design will break the mandatory constraints of Ildefons Cerdà’s Eixample urban plan with its proposal, not only because the building exceeded the height allowed by the City Council of Barcelona, but by its use of materials that gave color to the facade: ceramics, iron, sgraffiti, stained glass, and so on. Puig i Cadafalch was one of the harshest critics of Cerdà’s urban plan. Original elevation of the facade before the changes forced by the City Council (1898). AMCB. Fondo Ayuntamiento de Barcelona. 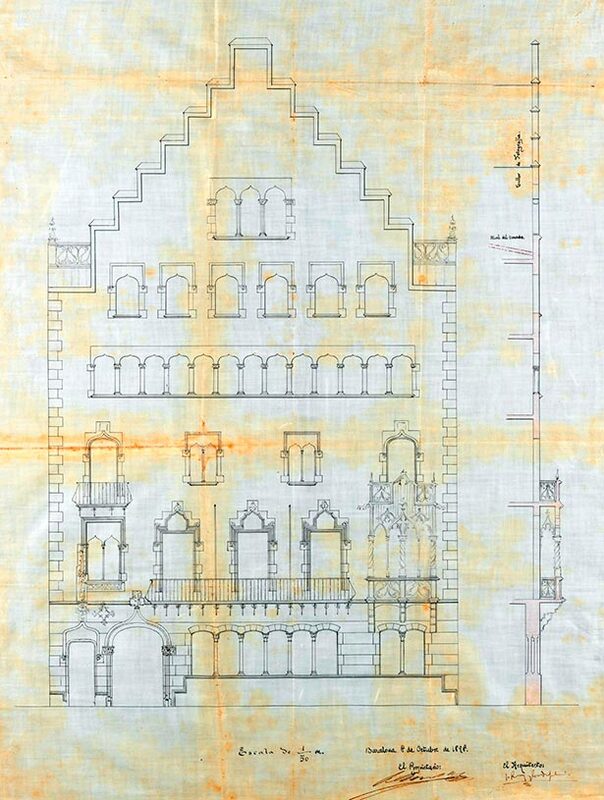 Elevation of the facade (1899). The elevation was modified to adapt it to municipal regulations, but luckily, this one was not built. AMCB. Fondo Ayuntamiento de Barcelona. The building is inspired by 17th century Dutch houses, with a typically Flemish facade covered in triangular-shaped ceramics and flat at the top. The lower facade and entrance are decorated with sculptures by Eusebi Arnau with traditional Catalan motifs, such as Sant Jordi (Saint George) slaying the dragon, and also in honour of the chocolatier owner, including family surnames and references to his trade. Inside the house, the majestic foyer stands out the large skylight of Espinagosa that allows the entry of natural light, as well as the main staircase made of marble that gives access to the noble floor. Amid the profusion of Modernista architecture in the Eixample, Casa Amatller on Passeig de Gràcia stands out as one of the most spectacular buildings. Apart from being a chocolatier, Amatller was also a photography enthusiast, and his daughter converted the family home into an art centre, the Institut Amatller d’Art Hispànic. A selection from her father’s vast collections is on display on the ground floor.